Using a good ad blocker is becoming increasingly important with the growing dangers of malicious advertisements (also known as malvertising). Blocking ads on your router through a VPN (virtual private network) is a powerful solution because this will protect your entire network and all connected devices, without installing separate software on each device. Tracking – Think of every ad as a digital surveillance camera, quietly recording your browsing history, keystrokes, and page views. Malware – Malware can infect your device whether you click the ad or not. For example, malware hidden in the pixels of an image can infect your device in seconds when a website loads (this is even happening to major websites, including the New York Times and BBC). Ransomware – Another form of malware, ransomware is a growing problem whereby your entire device will be locked up or encrypted, and then held as “ransom” unless you pay some hacker for the decryption key (which may or may not work). This is affecting all devices from computers to tablets, phones, and even smart TVs. Note: browser add-ons and extensions will only work on specific devices and browsers, but will not protect all devices (such as smart smart TVs or gaming systems). The other major drawback of using browser add-ons is that you will be easier to track and identify through browser fingerprinting. This guide will give you step by step instructions for setting up a VPN on a router, which uses a built-in ad, tracking, and malware blocker. 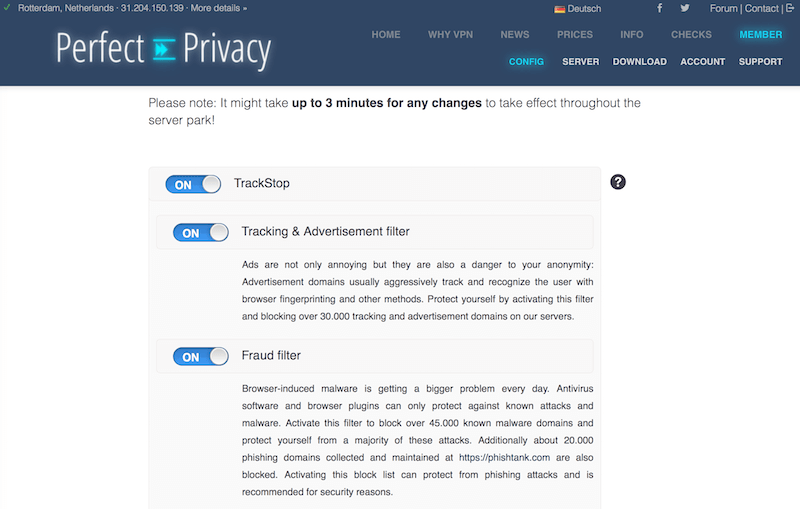 The only VPN I have come across that offers a powerful and customizable advertisement, tracking and malware blocker is Perfect Privacy. This unique feature is called TrackStop. The only line of routers that offers a large selection of VPN-ready models is Asus. But for a complete overview of all your options, see the Ultimate VPN Routers guide). A subscription to Perfect Privacy (see Perfect Privacy review here). An Asus VPN-ready router, which can be configured with a VPN right out of the box. Important – Not all Asus routers work with VPNs. The routers listed below are all VPN-enabled with the default ASUSWRT firmware, with corresponding processing power (CPU). Note: The fastest VPN routers from the list above are the bottom two options with AES-NI encryption acceleration processors. These are the newest Asus routers on the market. Note: if you do not have an Asus router set up yet, follow steps 2-7 here. Now you will need to get the Perfect Privacy OpenVPN configuration files. First, log in to the Perfect Privacy member area. Once logged in, you can download the OpenVPN configuration files linked below. Important: Use the configuration files below from Perfect Privacy, because they are specially suited to Asus routers and the version of OpenVPN used by the ASUSWRT firmware. This configuration uses the OpenVPN AES-256 protocol, which is secure, stable, and fast. You can use either the UDP or TCP files. The download is a zipped file that includes all server configurations (locations). Every .ovpn file corresponds to a VPN server location that you can use with your Asus router. Now that you have the files you’ll log in to the router admin area to configure them on to the router. Connect to your Asus router wireless network and open a new browser. 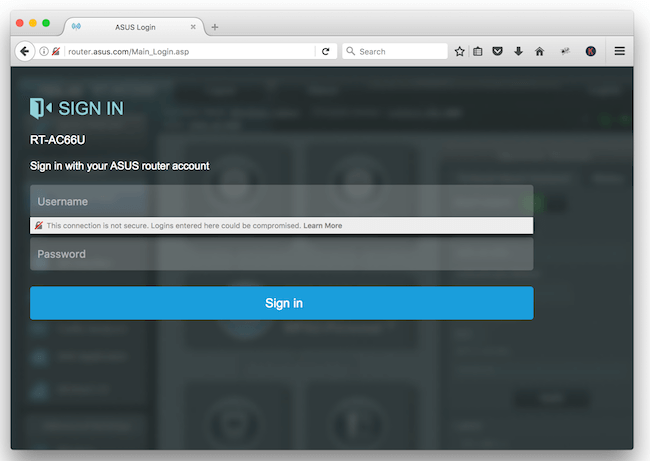 Enter either http://192.168.1.1 or http://192.168.2.1 into your URL address bar to access the Asus admin page. (Tip: bookmark this page for quick access.) Now sign in using your username and password. Now in your router admin area, select the following: VPN (left side of the screen) > VPN Client (top) > Add profile > OpenVPN. In the OpenVPN tab of the router admin area, enter the following information. Enter your Perfect Privacy username and password. Click Browse, open the .zip file from earlier, then select the specific server you want to use, click open. Now click Upload to upload the .ovpn file. At this point you should see the VPN server configuration added to the VPN Server List. Now click Activate to enable the router-VPN connection and wait for the router to establish the VPN connection (it will take a few seconds). When the VPN connection is activated, you should see a check mark on the far left under Connection Status. 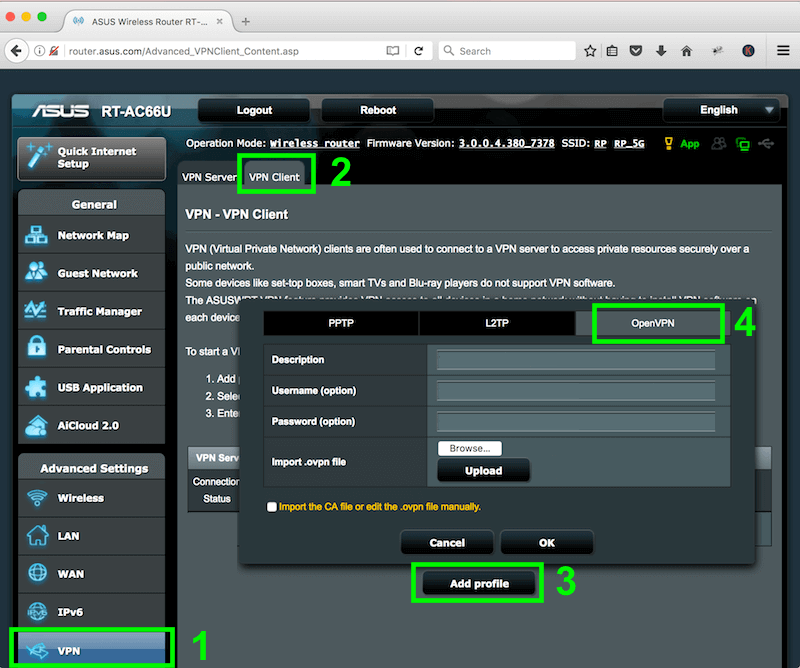 You can also add other VPN server configurations (different locations) to your Asus router. This gives you the ability to quickly change VPN servers in your router admin area. Just click Add profile and upload another .ovpn configuration file using the same steps as before. Now you can test your router’s VPN connection to make sure everything is working correctly (notice I activated the Amsterdam VPN connection). Go to the Perfect Privacy IP Check page to verify your router is using the VPN server’s IP address. Now you will activate the advertisement/tracking/malware blocker within your Perfect Privacy account, which is called TrackStop. Activating the TrackStop filter will block malicious domains at the VPN server level. With your router always connected to the VPN server, you will have continuous protection on all your devices whenever you are connected to your home network. Every device will be protected, without having to install any additional software. Enable the TrackStop switch (on). Enable the Tracking and Advertisement filter (blocks over 30,000 tracking and advertisement domains). You can also filter out other domains, such as Google domains and social media domains (which also track your activity). Now wait about 5 minutes for these changes to update across the VPN server network for your account. After you’ve waited 5 minutes, reset your VPN connection in your Asus router admin area. Go to VPN > VPN Client > then click Deactivate under the active VPN configuration. Wait a few seconds, and then click Activate to re-activate the connection. Speed and performance – Using a VPN on a router is a CPU-intensive task, requiring the router to process lots of encrypted data. You may notice a speed reduction, corresponding to the CPU of your router (see here for realistic CPU/speed expectations). However, many websites will now load faster because the advertisements are blocked by the VPN server (and therefore won’t need to load). Two router setup – One option is to use a double router setup: a regular router and a VPN (encrypted) router. With this option, you can connect devices to either the VPN router (protected) or the regular router that goes through your ISP (unprotected). Instructions for this setup can be found here. ASUSWRT by Merlin – If you’re looking for advanced VPN configuration options, you can use the ASUSWRT by Merlin firmware. This will give you the ability to create advanced connection rules (select which devices go through the VPN and which don’t) and kill switch protection features if the VPN connection drops. You can download this firmware here. Preconfigured router – If you are limited on time or don’t want to go through the hassle of installation, you can get a router that is preconfigured for Perfect Privacy. Flashrouters offers a nice variety of routers that are all configured to work with Perfect Privacy. You can see the available models here. No whitelist option – One drawback with this setup is that there’s no option to “whitelist” a domain that may be blocked. But you can get around that issue with a two router setup, temporarily deactivating TrackStop, or using ASUSWRT by Merlin firmware, which gives you the option to go through your VPN or regular ISP connection (at the same time with different devices). 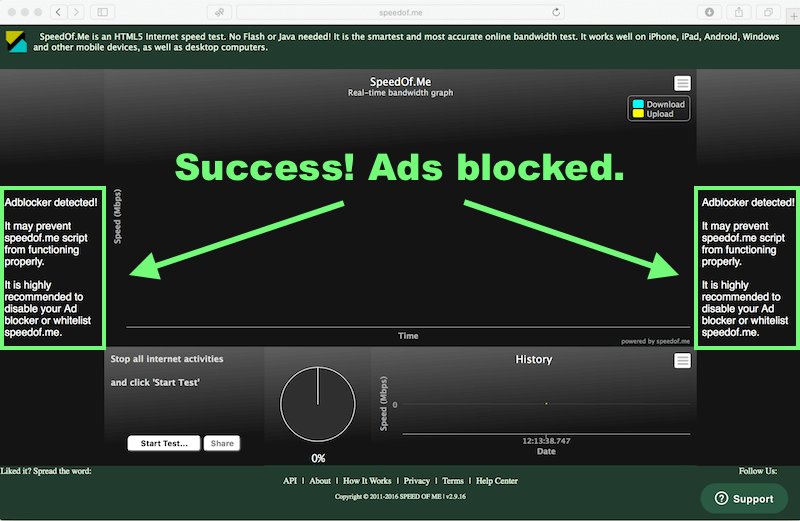 Ad blocker alternatives – Another alternative for blocking ads on your entire home network is the eBlocker (review). This is a smart device that plugs in to your router and will protect all devices against tracking and tracking advertisements. It also has the ability to whitelist certain websites. The one drawback is the cost, at around $200, but it works very well. That’s it, enjoy your ad blocker VPN router setup! Amazon disclaimer: Restore Privacy is a participant in the Amazon Services LLC Associates Program, an affiliate advertising program designed to provide a means for sites to earn advertising fees by advertising and linking to amazon.com. Sven Taylor is the editor behind Restore Privacy. He created this website to provide you with honest, useful, and up-to-date information about online privacy, security, and related topics. Is it possible to configure the router to multi hop multiple servers ? The only way to do this with Perfect Privacy is to enable NeuroRouting. 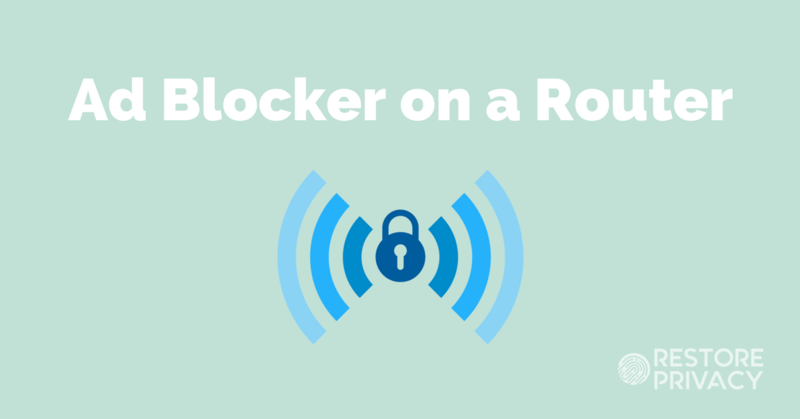 do you know if eblocker offers vpn kill switch? Hi Mike, this is a feature I would ask eBlocker about since they have updated and improved the device since I tested it last. Besides Perfect Privacy, both Cyberghost and Windscribe offer ad blocking, and protection from tracking and malware at the VPN level. I’ve used them both and they seem to run fine on my Netgear/DD-WRT routers (although Cyberghost was finicky to install). I have the Nighthawk R700P (AC2300) with DD-WRT firmware and use a hosts file on the router for ad-blocking. Im waiting for my Raspberry Pi 3 b+ to arrive which I will install Pi Hole on. Can’t wait for that. Sven, when you said in a post above about the steps in a http request using Pi Hole, wouldnt the request have to be sent to the router first then Pi Hole? Other wise how could a client know the address for the Pi Hole? I wanted to check-out the AB-Solution on my Asus RT-AC86U router but, flashing to ASUSWRT-Merlin didn’t work out right so I had to re-download the original Firmware from ASUS. Too bad, it would have been a cheeper option. Only wondering whether there are also abundent configuration possibilitys in the AB-Solution as there are with the eBlocker. That is quite odd. O have Asus RT-AC86U as well, downloaded AsusWRT Merlin and it installed with no issues. I installed AB-Solution as well, but I’m not sure if it is better than Pi-Hole, in terms of usage for every-day users. PI-Hole is easier to setup and somewhat easier to configure, because you can set the ASUS Merlin dhcp-option to Pi-Hole IP, and then set the DNS inside Pi-Hole Settings to the Router’s IP. Speaking of AB-Solution, AB-Solution has the neat feature of blocking ads sent via HTTPS. The drawback of AB-Solution is that the only way to configure it with Router being connected to VPN implies DNS leaks. Hi Sven, Just want to mention that I recently installed ExpressVPN on the Asus RT-AC86U router connected to eBlocker and so far, everything is running just fine. First, thanks for Restore Privacy and all the excellent info. I have a Mac and am considering using Perfect Privacy VPN with an Asus RT-AC86U router and possibly adding eBlocker as well for more options(though this router not listed on their compatibility page). Is this router compatible or would you recommend a different router/config? Thanks again. Hi Thom, I’m not sure if it’s compatible with eBlocker – it’s been a while since I tested eBlocker. I can say that Perfect Privacy’s TrackStop filter is a very powerful ad blocker and I use it every day. Now, given that you are a Mac user, you’d have two options for your Mac that I’ve found to both work well: either use the Perfect Privacy Mac OS app (available for download in their forums) but still in Beta, or use the IKEv2 setup on your Mac. This is explained more in the Perfect Privacy review. I like the IKEv2 setup because it is completely leak-proof, seamlessly connects and is “always on” when you enable “connect on demand” in your network settings. But if you want a simple VPN client that works well with OpenVPN right out of the box, VPN.ac is a good choice. Thanks very much for your quick reply. As per your comments, I think Perfect Privacy and either of their two Mac options would be a good fit for me. Currently using an Arris TG1672 Touchstone Telephony Gateway as my modem/router with Spectrum as my provider. Given that, which Asus VPN router(In the 1,000 -1400 Mhz range) would you recommend? Also, would it be preferable to retire the Arris altogether and get a stand alone modem? Thanks. Hi Thom, you can actually chain as many routers behind your ISP modem as you want to secure the network. I think the newly-released Asus 86u is arguably the best VPN router on the market because it has AES-NI which massively improves speed and performance. This is discussed more in the VPN routers guide. Why not block the ads directly on the router? Since you mention ASUSWRT-Merlin: AB-Solution is a hosts file based ad-blocker that installs on all routers running ASUSWRT-Merlin. More info on the http://www.ab-solution.info website. Good idea Lonelycoder. Thanks for the feedback. *Unless you get an error message, your comment has been successfully submitted and should appear within 24 hours. You can use any name and email address for the comment form (real or fake). Restore Privacy was created to provide you with honest, useful, and up-to-date information about online privacy, security, and related topics. To help us spread the message and reach more people, please consider sharing our free guides and linking to anything on the site.